Happy with this signing for several reasons, he's experienced, knows how to get promoted, played at a higher level but also has great crossing ability. The only risk is that he's had baggage at previous clubs. Also well done JP, another one you called out well in advance. Here's hoping Alcock also follows in the near future. Good to have a left back of our own. Um, we had Jordan Cranston for the past couple of seasons. Whether you rated him or not, he is still a left back. Interesting to see who has the honour of standing in for him for games 1 to 4 next season. Look at us, handing out 2 year contracts here, there and everywhere to players that are experienced! Your move, FGR. Or is it our move again? Real ambition being shown by the club right now, who cares what FGR are doing. If Winnie leaves to join them then more fool him, clearly motivated by that signing on fee rather than ambition to challenge next season. who cares what FGR are doing. I would imagine FGR are behind us because they didn't know which league they would be in next season, no doubt they will make signings and be looking to avoid another relegation scrap this time around whilst I believe we will be looking to challenge for play offs. Very disappointing. Not because of losing his ability but because he would leave us for them. He will fail under the coaching regime at FGR. If he goes there I expect to see him in non-league (or Scottish league) in 18 months - 2 years, several stone heavier. It's been an open secret for some time now, I mentioned it on here ages ago. That said, it's the first time we've lost a player we've wanted to FGR that I can ever recall and I feel they have been trying to do something like this for sometime (chasing Billy Waters last summer, then Dillon when we were interested). They are trying to prove themselves to be rivals and to consider themselves our equals but they are a long way off that. Forgetting rivalries, cracking signing for them and shows their intent for next season though. As someone above mentioned, shows the tide has turned a bit when they sign our (2nd) best player from us. His loss. Career will go down hill. If that’s what he wants, f*ck him. Looks decent for this stage of the season IMO. Could do with a natural RB, at least 1 striker (probably 2 if Mo leaves), and preferably another winger, but to be this prepared before we've even reached June is astounding. And we haven't even tapped into the loan market yet. We are now signing better quality and more experenced players. 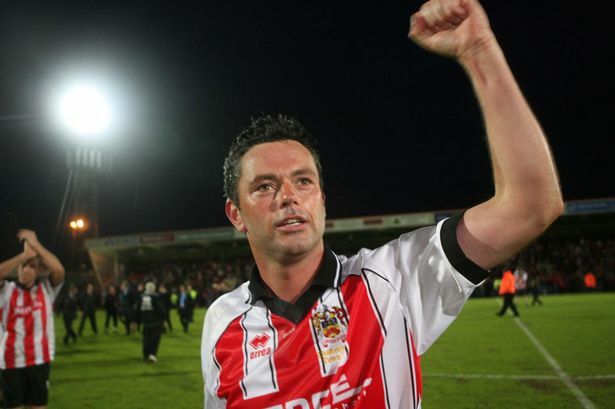 Winchester would struggle to keep his place at CTFC. Time to move on. I know it won't happen but wouldn't it be great if Winchester was just toying with them, playing them along and then right at the last minute pulled out and re-signed for us. The squad is taking shape but clear there will be another 3-4 players still to come as a minimum. With Winchester now leaving we need another creative midfielder (Morrell? ), a first choice right back (Alcock?) and a powerful striker (Akinde?) then of course we need 2-3 loans to pad out the squad. Also with our current squad I can see us playing 5-3-2 and wing backs, and having Broom/Addei available from the bench if we need to switch to 4-4-2. All it shows is they can offer more in terms of wages and signing on fees than us. As Robin says, it's an open secret he's going there and the only reason is the money. I don't blame him, if I was offered more money to not have to move and do the same job then I'd be out like a shot. It's a short career, he owes Cheltenham nothing, and he's allegedly being offered a lot more money than we can afford. Goodbye, good luck, hope you're s#!t in your games against Cheltenham. Oh, and welcome Chris Hussey - a nice 4 game ban to start the season but expect him to hit the ground running on his return. Will be interesting to see how they shape up - I'm imagining the defence has been shored up; now for the attacking roles?? Why is he banned for 4 games? Had a flare up with a fan when on loan at Swindle last season. It was five games, but one of those was the final game of this last season. I should point out, it was an alleged altercation with a fan, which the player refutes. Looking forward to seeing him and the other new signings play. Starting to feel the need to renew that season ticket after all! If he gave some stick back to a Swindon moron then we welcome him with open arms. Fair point. I think most of us would do the same in those circumstances!